The All Souls Trilogy boxed set is going on sale on October 30th! The boxed set includes hardcovers of all three volumes (The Discovery of Witches, Shadow of Night, and The Book of Life) as well as a limited edition of Diana’s Commonplace Book. This is the only opportunity to purchase the overwhelmingly popular Commonplace Book that until now has only been offered as a giveaway prize. The All Souls Trilogy boxed set is a wonderful gift for the holidays and a great way to treat avid readers with the rare Commonplace Book and to introduce newcomers to Diana Bishop and Matthew Clairmont. 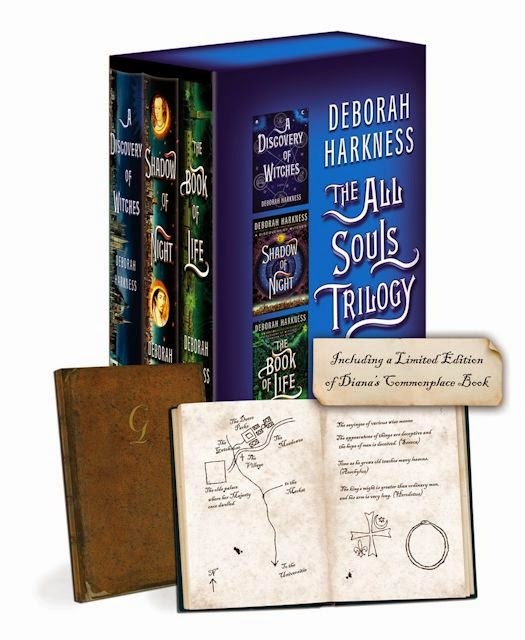 To celebrate its release, Deborah Harkness is hosting a giveaway of the boxed set on her Facebook page. US Residents may enter the contest until Halloween. Click here to view the post on the Deborah Harkness Facebook page and view additional details.